May 21, 2014 – Ealier this month Creekside Terrace, a 52-unit apartment community located in Castro Valley, became the first market rate apartment building in Alameda County to achieve certification from the Bay Area Green Business Program. The Bay Area Green Business Program is a California government program that assists local businesses to operate in an environmentally friendly manner. The Green Business Program requires property owners to comply with 140 required and optional environmental measures that are classified within six categories (General; Waste; Energy; Water; Pollution; and Wastewater). Some requirements are easy, such as beginning a recycling program or replacing all incandescent light bulbs with compact florescent or LED bulbs. Other requirements are more challenging such as switching to all environmentally friendly cleaning products or creating an Environmental Policy Statement. Built in 1973 by owner/operator Felson Companies, Creekside Terrace had to make many changes to the property and to its management operation to become more environmentally friendly. “We’ve wanted to make our properties more sustainable and the Green Business Program created a catalyst for environmental change by providing us with an ‘environmental roadmap’ that was easy to follow,” said Blake Felson, the Project Manager at Felson Companies who led the efforts. After making physical and operational changes, the property was audited by the Castro Valley Sanitary District, Pacific Gas & Electric, East Bay Municipal District, StopWaste.org, and the Alameda County Green Business Program. 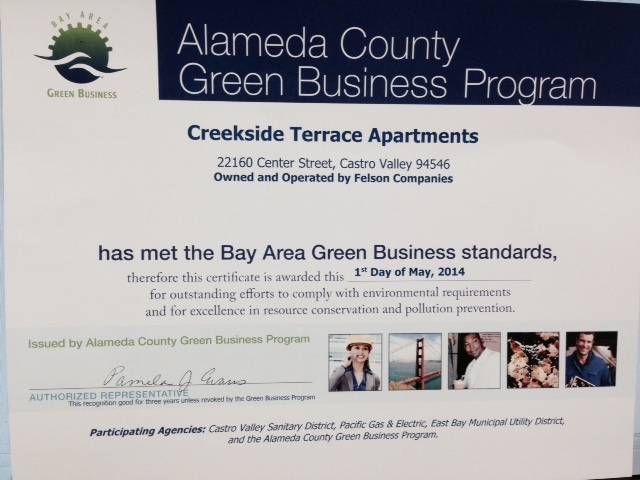 “Felson Companies has broken new ground in achieving Green Business certification for Creekside Terrace. We’ve had several non-profit housing organizations complete the Green Business certification, but Felson Companies is the first market rate management company in Alameda County to certify one of their properties. We hope that other market rate firms will follow their lead,” said Pamela Evans, Alameda County Green Business Coordinator. Felson Companies, Inc. is a privately held real estate investment company that specializes in the management of multi-family properties in the San Francisco Bay Area. Since its founding in 1948, the firm’s principals and employees have shared a strong commitment to the local communities in which they serve. For more information, visit http://www.felson.com. More information about the Bay Area Green Business Program can be found at http://www.greenbiz.ca.gov. Whether you like it or not, social media is here to stay. Facebook, Twitter, YouTube, LinkedIn, etc. have gotten too popular to be considered just a fad. The key to social networking will be for companies to utilize it to increase customer engagement and sales. At Felson Companies we’ve tinkered around on various social media platforms for the last two years trying to figure out how to adapt the technology to apartment property management. Through trial and error, we’ve found that social media can be used to increase information, communication, and feedback at our apartment communities. First and foremost, social media is a great way to inform residents. Residents may not see the big pink flyer posted in the laundry room telling them that the water will be shut off on Tuesday for 3 hours but they might see the posting about it on Facebook. Residents appreciate being able to read about what is happening at their community at their convenience. This is especially important for school aged residents as they might be less inclined to read notices posted around the community. According to property management software company Appfolio, 65.9% of residents use apartment social networking pages to learn about news, updates, and events related to their community. Second, social media provides an opportunity to increase communication channels. Throughout the past decade, it has been widely documented that face to face communication between residents and property staff has decreased. A study by IREM in 2011 found that 89% of residents prefer to communicate via e-mail rather than by phone or in-person. Additionally, Appfolio reported that 20.5% of residents use social networking pages to communicate with apartment community staff. Since social networking posts are public we obviously advise using caution. For instance, don’t write things like, “Fred, what’s the deal? Your rent was late again this month!” We recommend staying positive by writing thank yous, compliments, and congratulatory messages. These small gestures will help to build a closer knit community at your property which will hopefully lead to higher resident retention. 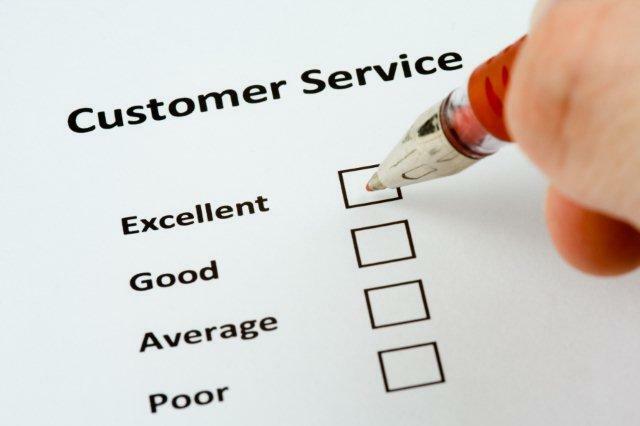 Lastly, one of the most important benefits to social networking is its ability to solicit feedback from customers. Appfolio reported that 23.4% of residents use their community’s social networking pages to provide feedback. Whether good or bad, feedback can become a very valuable tool if you act upon it. For instance, a prospective resident told one of our managers that they called us after reading a positive comment from a current resident on our Facebook page. We promptly then placed that posting more prominiently on our page and thanked the resident for the posting. Negative feedback on the other hand can help you fix things you may have overlooked or haven’t taken seriously enough. Earthquakes: Will your property be ready? 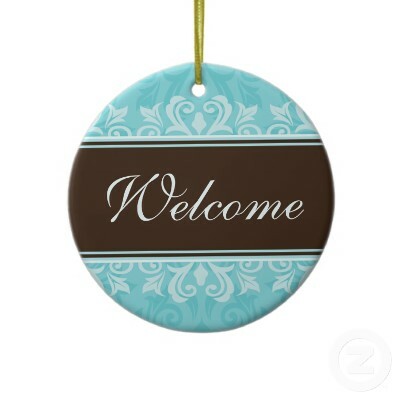 Welcome to Felson Companies’ new blog. On this site we will post commentary about our latest happenings, information about the apartment industry, and news about the neighborhoods surrounding our apartment communities. Thank you for reading, we hope to keep you well informed and interested.